They may be the smallest of the big cats, but when it comes to adaptability, intellect, and brute strength, there's nothing small about leopards. With close relation to tigers, lions, jaguars, and cheetahs, leopards are known to quietly roam certain parts of Sub Saharan Africa, Asia, and Siberia. Leopards are largely nocturnal animals that prefer to remain out of the public eye. It is an opportunistic hunter, meaning that it'll take down any prey that happens across its path, including the occasional careless human. There have been a number of reported fatal leopard attacks on humans in India, the most famous of which are the Leopard of Rudraprayag and the Panar Leopard. But don't worry, these animals haven't developed a love for human flesh and if given a choice between you and a fat antelope, the Leopard would certainly choose the later. These animals are also incredibly strong and are the only one of the big cat family known for their ability to drag the deadweight of prey up a tree; a task that requires great climbing skills and brute strength. Contrary to what you may have previously heard, a leopard can change its spots. Just as in the case of the Jaguars, the Leopard's coloration is due to the expression of a dominant gene, but this is not to say that there aren't other pigmentation possibilities. Leopards that lack this gene tend to be black and are commonly known as Black Panthers, but there have been cases of strawberry colored and albino leopards in existence. For thousands of years, humanity has had an unwavering fascination with these big cats. In African folklore, they are seen not only as fierce warriors and hunters, but also as cunning and deceitful animals. It is said that you never know what a leopard is up to until it's too late and that the animal employs a number of tactics to lull its prey into a false sense of security. This accounts for the famous saying, "a leopard cannot change its spots." In these cultures, the Leopard's spots are thought to symbolize the ability to hide the truth about who you are, therefore giving yourself a tactical advantage in any situation. This point wasn't lost on the noted Italian poet, Dante, when he wrote the classical series, The Divine Comedy. In Inferno, Dante makes use of leopards to represent deceit, fraud, and malicious actions, as well as to explain the Christian views on these traits. This is a stark contrast to the views of many African traditions in which the leopard is seen as a mentally astute animal. In many parts of England and Western Europe, leopards are prominent features in the coat of arms for many old family bloodlines. In these designs, their image is so stylized that it is often confused with that of the Lion. In Heraldry, leopards usually appear in groups of threes and the animal is used to evoke a sense of honor and nobility. Many see the Leopard as a valiant warrior who never runs from a battle. These beautiful animals also have a strong connection with the spiritual realm. Shamans and spiritual leaders often wear leopard pelts in the belief that doing so will protect them from evil spirits. Ancient Egyptian priests always wore leopard skins in an effort to protect them from the god of darkness and chaos, Seth, and to symbolize their triumph over his evil misdeeds. For many spiritual leaders in indigenous tribes, these animal totems are often viewed as guides to the spiritual world because of their ability to adapt and thrive in seemingly different environments. A leopard is as much at home on the ground as it is high in the trees and can live in the sweltering heat of the jungle or the plains of the African Savannah. Even though the myths and beliefs that surround the mysterious leopard are as numerous and varied as cultures from which they arise, one thing is common amongst all of them; there's no denying the fact that a leopard is an exquisitely beautiful animal. Leopard Tattoos come in a variety of sizes, but the color scheme of this design is usually standard. These tattoos are usually colored to resemble actual leopard spots or are done with a tribal motif. Of course, the most popular variation is the Leopard Print, which has the distinction of being wearable by both women and men. Leopard Tattoos are usually done by people who enjoy the solitary life. They love the inner peace and tranquility that comes from being outside the daily Rat Race and hate being herded around in the masses. Persons with Leopard Tattoos identify with the quiet, peaceful life of the leopard. As with most designs with a unique feature like leopard spots, it is always important to think about the placement of the tattoo on your body. Putting your Leopard Tattoo on a section with a large muscle adds a new dimension to your design by giving your body art the illusion of movement. Leopard Tattoos can also be designed to portray a tribe motif. Since the tribal patterns from each region of the globe have characteristics that are unique to only that region or group of people, a Tribal Leopard Tattoo identifies you as someone who is deeply rooted in the indigenous culture of that particular region. These designs have spiritual associations which empower the wearer with the traits of this animal totem. How can an elusive animal become even more mysterious? How about a black coat? Black Leopards are, in reality, black panthers, but this distinction is mostly lost on the general population. A Black Leopard Tattoo emphasizes your need to remain unknown and as popular as an unheard legend. You pride having your privacy and tranquility, and are truly at home when you have the freedom to roam undisturbed. Would you cover 99.2% of your body with a Leopard Print Tattoo? Tom Leppard certainly would and now the Scottish Brave heart has to honorable distinction of having been in the Guinness Book of Records as the world's most tattooed man. Leopard Print Tattoos can also come in a variety of shapes; there are Leopard Hearts, Leopard Stars, and Leopard Butterflies, just to name a few. Leopard Prints are versatile and can be incorporated into any design to give the overall piece a particular look and meaning. Leopard Prints symbolize your strong connection with the solitary life of the animal. In essence, your spots help you to mask your true intensions and to seize the perfect opportunity to strike when the moment is right. A Leopard Print Tattoos represents your killer hunting instincts, adaptability, and ability to manipulate any situation to your advantage. These designs also symbolize your connections to nobility and the Divine. The best way to communicate your spiritual message to the world is through your body art. 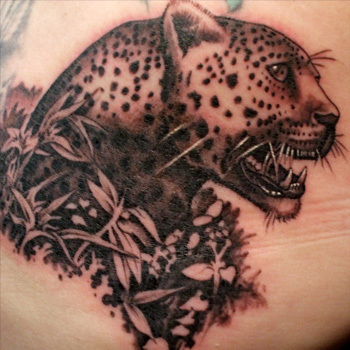 Designs like Leopard Tattoos represent many of the mythical aspects of these majestic creatures. Regardless of which variation you chose, it is important to incorporate elements that speak to your personality and flatter your skin and body type. When it comes to creating a great design, the only limit to your dream is your imagination, so don't be afraid to go big. If you need a little help dreaming up the next piece, then visit our design page at www.itattoodesigns.com and take advantage of our Custom Tattoos page. Our team of tattoo experts can create a truly unique piece that's just perfect for you.